Monogram jewelry is traditional, classic, and will never go out of style. 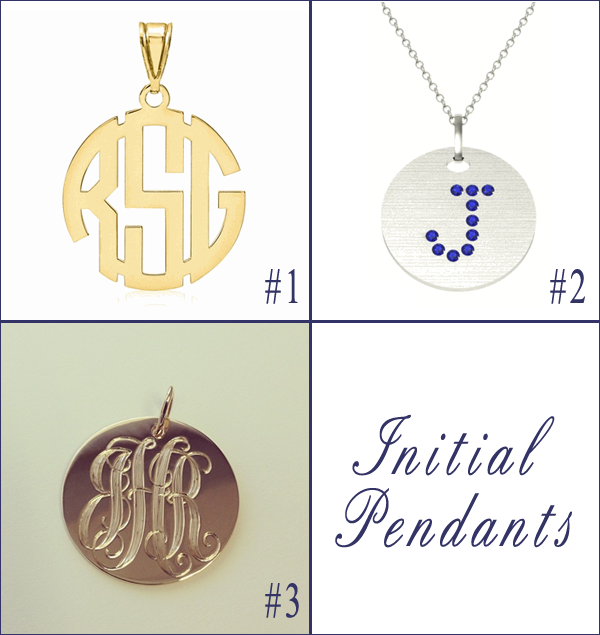 Maggie discussed some of our new monogram jewelry that deBebians has to offer recently, but I wanted to highlight our initial pendants specifically. Not only do these make wonderful push presents for a new mother, they also make great gifts for a recent high school or college graduate. This 14kt yellow or white gold pendant features bold, block font letters. This time-honored pendant weighs approximately 1.52 grams and will be featured on a 16 inch or 18 inch matching gold chain. These pendants are solid 14k gold. A gemstone letter pendant can feature the initial of your choice in the desired gemstone. Choose either the school’s color or the wearer’s birthstone to give the piece an extra special touch. The pendant that is shown features blue sapphires, which would be perfect for a graduate whose birthday is in September, for example. deBebians offers both flush set or pave set gemstones or diamonds. One, two, or three initials may be engraved on the face of this yellow gold pendant. The provided image shows our stunning hand-engraving option, but we also offer computer or laser engraving. Though these gift ideas are appropriate for graduation, I personally think that are also thoughtful gifts for a new bride or for a new mother. Visit deBebians to view all of our fine jewelry and please do not hesitate to contact one of our jewelry experts or GIA graduate gemologists with any questions.